I haven't bought myself clothes in a really long time. I was pregnant last year, so I did buy some maternity clothes, but everything I wore was either from my pregnancy with Henry or secondhand from the Goodwill. A few friends also lent me maternity clothes. So I haven't bought "regular" clothes in a while. When I did do a little shopping right before I returned to work following my maternity leave, I was disappointed. Everything was so expensive, and it's not as if they were made out of quality materials. Things just cost more now, even polyester. :) I also had a hard time finding things that I liked 100% in terms of the style. I tend to prefer longer tunic style tops (I think they're more flattering on me), and we've had the skirt discussion before. Modesty issue aside, I just don't look good in knee length or above skirts. I do tend to find pants pretty easily, although the fact that mens' pants are made with waist and length measurements and womens' aren't is completely ridiculous to me. But anyway, a lot of the tops were longer but too low cut, or had a nice neckline but cut funny on the sides, etc. 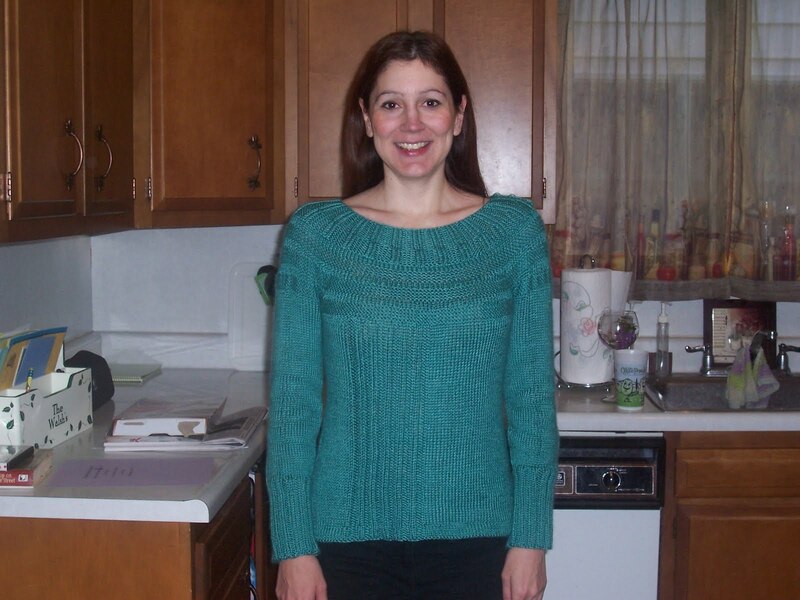 So, this fall I finally finished up a sweater that I'd been knitting for quite a while. It hadn't taken me all *that* long I suppose, I had just put it aside for a long time. It's the sweater I'm wearing in the photo above. I really liked the neckline on it, and the waist taper, just a very feminine design, to me. And it's made from a wool/bamboo blend yarn. Very warm. It actually could use to be a hair smaller, but overall it fits pretty well and looks nice, especially for a first sweater. So I've been thinking: maybe I'll start making myself more clothes. Granted, this would be a much faster process if I could actually *sew* clothing, but that's not happening right now, so knitting it is. It'll take me quite a while to amass any kind of wardrobe enhancement, but we'll get there. I'm going to be making this sweater with a cute snowflake motif at the waist, and this one as well, I think in a deep purple that reminds me of Advent. All out of real wool or alpaca blends. And I can tweak them how I want too, make them longer, slimmer, etc. We'll see how it goes, and it may be 2 years before they're actually done, but I will persevere. :) I'm crocheting a pretty lacy cardigan-like item right now, in recycled cotton. (Mike: "You wear something under that, right?" "Um, YES, Honey." ":) ). Relatedly, the cost of wool is on the rise, and prices are reflecting it. Despite Mike's alarm at glimpsing my yarn stash last night (it's not THAT large, just 2 plastic bins full :) ) I may buy the wool for these 2 sweaters before the upcoming price increase at Knit Picks. Why pay more later, right? I always like to have enough yarn and books on hand that if we're quarantined due to a nuclear disaster for a year or more, I won't be bored. I mean, it doesn't hurt just to be sure, right?